Gorgeous natural light streaming through the large windows caresses this beautiful bride as she smiles at the man who will become her husband in just a few moments. 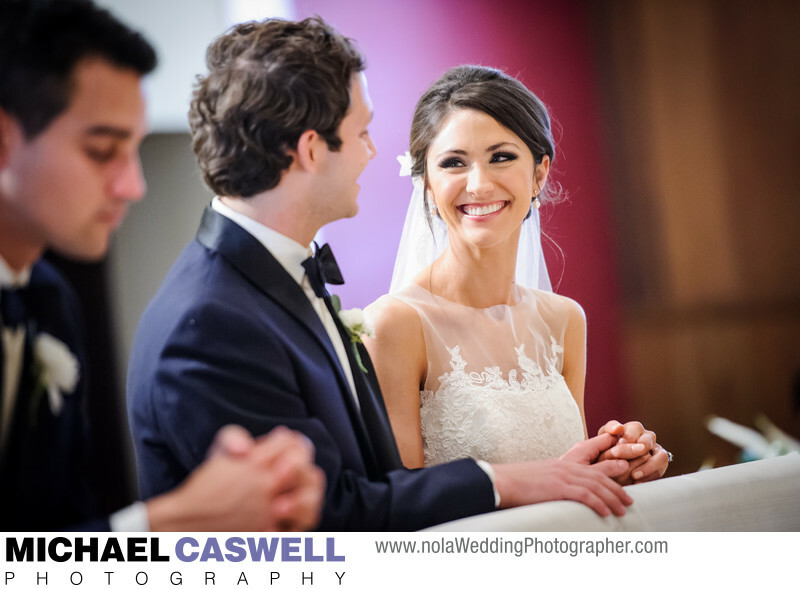 This wedding ceremony took place on a beautiful Saturday afternoon in April at Saint Charles Borromeo Catholic Church in Destrehan, Louisiana which is located just west of New Orleans. Daytime church weddings often feature spectacular lighting like this, with ample indirect daylight shining through the often large stained-glass windows that line the sides of most churches, but without the adverse effects that harsh direct sunlight outside can cause. After the ceremony, the reception was held back in New Orleans at Latrobes in the French Quarter. But there are also reception venue options closer to the church, such as Destrehan Plantation and Ormond Plantation, both of which are a very short distance away on River Road, and La Maison Magnolia in Norco is fairly close as well. Location: 13396 River Rd, Destrehan, LA 70047.